Can you believe it?? 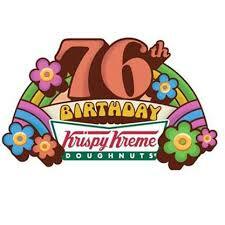 Krispy Kreme is celebrating their 76th birthday this week. Head on over to you local Krispy Kreme and celebrate with this sweet deal. On July 13th, buy a dozen donuts and get a dozen for ONLY $.76 at Krispy Kreme.